BUJUMBURA March 15th (ABP) – The Union of Disabled People of Burundi (UPHB) and its partner organizations which are the Emmanuel Churches Community (CEEM) of Burundi, the Diocesan Development Organization of Bujumbura (ODDBU) and Caritas Burundi, joined the world on Wednesday March 13, 2019 to celebrate the International Day “Tirer la sonnette”. Indeed, this day is a global initiative launched by the Liliane Foundation, a Dutch organization working to promote the inclusion of children and young people with disabilities around the world, especially in developing countries. It consists of an advocacy campaign with governments for inclusive education of children with disabilities. As usual, this day takes place throughout the country following the geographical areas of Burundi including the south, north, east and west. 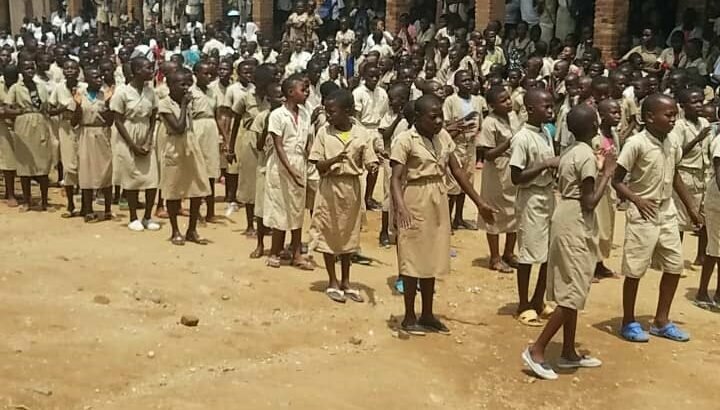 In Bujumbura, the ceremonies took place at the Busoro Basic School (Kanyosha zone) under the chairmanship of the provincial director of education and the communal director of education. The ceremonies marking the day began with a parade, on rhythm of fanfares, students were guided by their teachers and other persons in authority who were on site. The slogan was the same “All children are welcome to school as well as children with disabilities”. By the way, this was the theme chosen globally for this year. The very ceremonies were marked by activity, “tirer la sonnette”. The latter consists in observing a total silence while standing, someone counts from 10 to zero, and arrived at zero, everyone makes a noise with sound objects and those who do not have them make use of their mouths while crying. The gesture is done for a minute. This action is symbolic and meaningful. According to information received on the site, it is 10 to zero to indicate that a child living with a disability faces difficulties of any kind. According to the same sources, the entire community has to do something to get the disabled child out of those difficulties and reduce them to zero. It is up to the government, the community, local as well as international organizations to carry out large-scale actions in favor of the latter’s education, the sources said. The legal representative and chairperson of the UPHB, Ms. Adélaïde Nyigina, called on the persons in authority to fully try harder in that fight to ensure an education for children with disabilities, essential to their development. The education of a child living with a disability is not at all a charitable action in favor of the latter but it is a right they must acquire without any conditions, she added. Provincial Education Director Patrice Tuhabonyimana said in his remarks that the government has already embraced the inclusive education of children with disabilities. It will spare no effort to support organizations working to improve the educational conditions of such children.